We’d love your help. 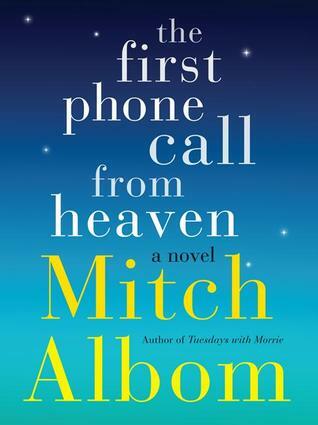 Let us know what’s wrong with this preview of The First Phone Call from Heaven by Mitch Albom. The First Phone Call from Heaven tells the story of a small town on Lake Michigan that gets worldwide attention when its citizens start receiving phone calls from the afterlife. Is it the greatest miracle ever or a massive hoax? Sully Harding, a grief-stricken single father, is determined to find out. An allegory about the power of belief--and a page-turner that will touch The First Phone Call from Heaven tells the story of a small town on Lake Michigan that gets worldwide attention when its citizens start receiving phone calls from the afterlife. Is it the greatest miracle ever or a massive hoax? Sully Harding, a grief-stricken single father, is determined to find out. An allegory about the power of belief--and a page-turner that will touch your soul--Albom's masterful storytelling has never been so moving and unexpected. To ask other readers questions about The First Phone Call from Heaven, please sign up. Mary I read this on my Nook some time ago, it's one of his best but then I think so with each of his books. He writes with such sensitivity &…moreI read this on my Nook some time ago, it's one of his best but then I think so with each of his books. He writes with such sensitivity & compassion. Hi. I'm in the middle of this book, didn't find the first half enjoyable, so I wonder should I continue or not. Maybe there are surprise in the second half? Thanks. Betty I felt the same way. It does get better and is worth finishing. "No soul remembered is ever truly gone." P.S. Mom, I'm still waiting for the phone to ring! I know that to some people religion is the basis of life and why they are 'here'. I think religion is indeed 'the opiate of the masses', it exists so people don't have to face up to the consequences of their own actions. They can blame it on fate, some old guy up in the sky, or lots of people up in the sky, or the one down below in the pit, or the ones with lots of arms or blue heads or two faces or or or... there are so many gods to choose from and everyone who believes in one or more of them i I know that to some people religion is the basis of life and why they are 'here'. I think religion is indeed 'the opiate of the masses', it exists so people don't have to face up to the consequences of their own actions. They can blame it on fate, some old guy up in the sky, or lots of people up in the sky, or the one down below in the pit, or the ones with lots of arms or blue heads or two faces or or or... there are so many gods to choose from and everyone who believes in one or more of them is convinced that they are right and everyone else's gods just plain don't even exist. But when we start saying that the Christian God actually gets on the telephone.... well, I'm sorry my credibility has been stretched wayyyyy too far. But I'm laughing. What I want to know is if you don't hear the call, do you get a text saying you have a missing call from God? Interesting premise but was let down by the lack of emotional connection I typically feel when reading a Mitch Albom book. Was more of a mystery book then an emotional/inspirational book. So ready to love this! Mitch Albom's books truly are life-changing and incredibly inspiring; I love each and every one of them. Just realized the release date reads: eleven / twelve / thirteen. I am truly, madly, deeply sorry, but this book landed itself onto my list of disappointing books of 2013. In addition to this year's Towering, Splintered, and The Ocean at the End of the Lane, know that it is with a heavy heart that I sadly rank The First Phone Call From Heaven among t So ready to love this! Mitch Albom's books truly are life-changing and incredibly inspiring; I love each and every one of them. I am truly, madly, deeply sorry, but this book landed itself onto my list of disappointing books of 2013. In addition to this year's Towering, Splintered, and The Ocean at the End of the Lane, know that it is with a heavy heart that I sadly rank The First Phone Call From Heaven among them. I'm giving it a 3-star because while Sully's story was a 4-star, everybody else's was only a 2. The biggest problem I had with this book was the nearly-overwhelming number of characters and POVs it had. Usually I welcome multiple character POVs with a huge bear hug, but that wasn't the case with this book. I understand that with a plot such as this, you kinda NEED to include multiple POVs, but when the POVs expanded to minor characters like Phil and Amy, it became too much for me. One: I couldn't care less about what went through their heads, and two: reading their parts wasted my time in quickly getting to Sully's part. I quite enjoyed reading about Sully, and Mitch's style of unraveling Sully's mysterious past was pretty much the only motivation I had for finishing the book. This book just didn't work out for me. I love, love, love Mitch Albom and his books, (haven't read The Time Keeper yet), but this book just didn't have the same fictional, magical storytelling as did The Five People You Meet in Heaven and For One More Day. A nice, thought provoking little story which is interesting whether you believe in Heaven or whether you do not. Not that the author provides any great solutions as you are left at the end with as many facts as you have at the beginning. The most interesting part to me was what happened to the world at large as people began to receive phone calls from loved ones who had passed on. At first it seems a good thing. Who wouldn't like to hear from a loved partner or child who has died, especially when A nice, thought provoking little story which is interesting whether you believe in Heaven or whether you do not. Not that the author provides any great solutions as you are left at the end with as many facts as you have at the beginning. I loved the backstory of Alexander Graham Bell as it coincided with the current day story, it has given me the desire to read more about Bell's personal life. My favorite quotes "What is false about hope?" and Faith is believing without the need for proof. I would read this story again. Όμορφη γραφή,γρήγορη πλοκή, επιστημονικές ανακαλύψεις και πλοκή προσώπων και γεγονότων δημιουργούν μια γλυκιά ατμόσφαιρα με έντονα συναισθήματα και αναπάντητα ερωτήματα που βασανίζουν ανέκαθεν το ανθρώπινο είδος! Η αγάπη σε όλο της το μεγαλείο και σε πολλές εκφάνσεις πρωτοστατεί. Ο πόνος μπροστά στο μη αναστρέψιμο ειναι κυρίαρχος δίνοντας προτεραιότητα στην ελπίδα για να τον γιατρέψει και σε δεύτερη μοίρα έρχονται η παρηγοριά η λήθη και ο χρ Τρυφερό,συγκινητικό,ανθρώπινο,και παραδόξως ρεαλιστικό. Ο πόνος μπροστά στο μη αναστρέψιμο ειναι κυρίαρχος δίνοντας προτεραιότητα στην ελπίδα για να τον γιατρέψει και σε δεύτερη μοίρα έρχονται η παρηγοριά η λήθη και ο χρόνος. Κανεις δεν ξεχνάει τα άτομα που λάτρεψε. Κανεις δεν αρνείται να ακούσει τον ήχο της φωνής που αγάπησε πολύ. Κανεις δεν θέλει να δει την αλήθεια που πονάει αβάσταχτα όταν μπορεί να νιώσει απόλυτη ευτυχία έστω με ένα ψέμμα. Όλοι ελπίζουν στο παράδοξο το αδύνατο το απραγματοποίητο της ζωής φτάνει να βρουν ένα ελάχιστο ίσως και ψεύτικο σημάδι που προμηνύει ένα σημείο επαφής με πρόσωπα χαμένα και λατρεμένα. Ένα ονειρεμένο... τηλεφώνημα συνεπάγεται όλου του κόσμου την ευτυχία και τη χαρά. Κανεις δεν πεθαίνει όταν τον αγαπούν και τον θυμούνται!! This was my second novel of Mitch Albom. The first one was The Time Keeper and I love that book, carrying a lot of life lessons. This one, too. Mitch Albom is really one of the master-of-life-lessons writers. The book speaks the story of a small town on Lake Michigan that gets worldwide attention when the media broadcast to the world that its citizens start receiving phone calls from their loved ones in the afterlife. Is it really the greatest miracle ever or just a massive hoax? I won't tell you of course because that goes the most interesting part of the story. I'm kind of confused at first because I assumed it was only written with one point of view but hell not. There are a lot yet I'm quite pleased I've got to sort them out. Point of views from people who received the phone calls that are willing to tell everyone; people who liked to keep it for themselves; and other who wanted to find if it is just a hoax. And I'm kind of engrossed hearing from their different point of views. On top of that, the fact or history about the invention of the telephone was incorporated here. As an ECE, I have read those facts but this book gave to me the other facts that I didn't know about Alexander Graham Bell and his invention of the telephone and I was happy I've found it out. Indeed, First Phone Call from Heaven was a story of almost everyone, if not everyone, who believes in miracles. A captivating story of faith, belief, trust and forgiveness with characters that I was surely attached to, reading their own happiness and grievances in life. I was not impressed with this book. Having just read The Five People You Meet in Heaven a few days prior, and loved it, I was expecting more of the same from The First Phone Call From Heaven. Unfortunately, nothing I loved about TFPYMIH carried over into this book. While the theme of TFPYMIH centered on understanding your own life in relation to others, the theme of TFPCFH just seemed to be whether it was believable enough that Heaven existed or not. Since the start of the novel I found it diffi I was not impressed with this book. Having just read The Five People You Meet in Heaven a few days prior, and loved it, I was expecting more of the same from The First Phone Call From Heaven. Unfortunately, nothing I loved about TFPYMIH carried over into this book. While the theme of TFPYMIH centered on understanding your own life in relation to others, the theme of TFPCFH just seemed to be whether it was believable enough that Heaven existed or not. Since the start of the novel I found it difficult to believe that the short, vague conversations with the dead could be real. Although Albom left a twist at the end to insinuate that legitimate phone calls from heaven did occur, some split-second reasoning (ie. That Belfin had programmed the calls to take place after his death) made the twist rather flimsy. Also, The writing was not fantastic. I found that for a 300 page novel, it should have been long enough to support some character development, had there been fewer characters to follow. The first 100 pages of the story seemed rather repetitive, since Albom basically took the reader through the same event (someone receives call from a loved one, debated whether or not to tell someone) with about six different characters. Finally, Albom described the female characters by their presence or absence of makeup about six or seven times, which I found weird and unnecessary. 1. There is quite a bit of history surrounding Alexander Graham Bell and Elisha Gray (who?). I love history. 2. There is a scene a little over half way through in which one of the people receiving calls from heaven reacts in a very surprising way. My mouth dropped. 3. It's just flat-out well-written. I connected to the characters immediately which, as many (some? few? none?) of you know, is crucial to me. This is a book that, I think, most everybody would enjoy. در شهر کوچکی به نام کلدواتر در میشیگان، افرادی مدعی میشن که از بستگان و دوستان مرده شون تماس تلفنی دریافت کردن. تماس های تلفنی ای که در اون اظهار دارن بهشت وجود داره و اون افراد در بهشت ساکن هستن..
تارهای جادویی فرانکی پرستو، پنج نفر در بهشت منتظر شما در شهر کوچکی به نام کلدواتر در میشیگان، افرادی مدعی میشن که از بستگان و دوستان مرده شون تماس تلفنی دریافت کردن. تماس های تلفنی ای که در اون اظهار دارن بهشت وجود داره و اون افراد در بهشت ساکن هستن.. Interesting as a general idea but a bit poor in its developement. It didn't keep my interest alive till the end. In life people either believe in Heaven and an afterlife or they do not. Reading this book, the characters are also split into two camps. There are those who believe they are receiving phone calls from loved ones who are dead and others who dismiss the whole thing as a hoax. But which is it? Sully Harding is determined to find out the truth. The story contains interesting characters from different backgrounds who receive these phone calls and so the reader gets several viewpoints throughout the In life people either believe in Heaven and an afterlife or they do not. Reading this book, the characters are also split into two camps. There are those who believe they are receiving phone calls from loved ones who are dead and others who dismiss the whole thing as a hoax. But which is it? Sully Harding is determined to find out the truth. The story contains interesting characters from different backgrounds who receive these phone calls and so the reader gets several viewpoints throughout the story. I liked several of them but Sully was probably my favourite out of them all. I also liked finding out more about Alexander Graham Bell and his invention of the telephone, which is interspersed throughout the story. It gives a good picture of the way people respond to anything that is out of the ordinary and also of how the media sensationalises things as it changes the quiet little town of Coldwater Michigan into a circus of journalists and TV cameras, believers, the curious and those who protest. Sounds pretty much the response you’d expect to some news like this. I enjoyed it, as did my husband when he read it. It was actually him borrowed it from the library and I read it after him. While entertaining and having a mystery to solve, it may just give a few things to think seriously about as well. Αρκετά γλυκό βιβλίο που διαβάζεται ευχάριστα ξεκούραστα και γρήγορα. Βέβαια το περίμενα ένα "τσακ" καλύτερο. Ξεκινάει με την ιστορία να πλασάρεται ως φιλοσοφικού περιεχομένου, αλλά την βρήκα αρκετά αφελή, ώστε να μην το πεις βιβλίο φιλοσοφικού περιεχομένου. Σε αυτό το κομμάτι θα το έλεγα απλά… γλυκούλι! Στη συνέχεια μας το γυρίζει σε μυστηρίου… μπαααααααααα ούτε για πλάκα, ως προς αυτό το κομμάτι, θα το έλεγα απλώς… ενδιαφέρον. Πρωτότυπη ιστορία, ενδιαφέρουσα που θα μπορούσε βεβαία να ειπωθεί και Αρκετά γλυκό βιβλίο που διαβάζεται ευχάριστα ξεκούραστα και γρήγορα. Βέβαια το περίμενα ένα "τσακ" καλύτερο. Ξεκινάει με την ιστορία να πλασάρεται ως φιλοσοφικού περιεχομένου, αλλά την βρήκα αρκετά αφελή, ώστε να μην το πεις βιβλίο φιλοσοφικού περιεχομένου. Σε αυτό το κομμάτι θα το έλεγα απλά… γλυκούλι! Στη συνέχεια μας το γυρίζει σε μυστηρίου… μπαααααααααα ούτε για πλάκα, ως προς αυτό το κομμάτι, θα το έλεγα απλώς… ενδιαφέρον. Πρωτότυπη ιστορία, ενδιαφέρουσα που θα μπορούσε βεβαία να ειπωθεί και καλύτερα. Με κούρασαν λίγο όλα αυτά για την χάρη του Κυρίου, τον παράδεισο, την αγάπη κ.λ.π. Παρόλα αυτά μου άρεσε. 3,5 αστεράκια από εμένα. داستان افرادی در یک شهر کوچک که تلفن هایی از عزیزان مرده شان دریافت می کنند.و شخصی که به این تماس ها شک دارد و به دنبال اصل قضیه می گردد. 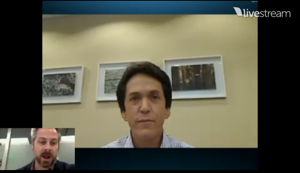 نکته ی جالب قضیه اینجاست که افراد بی ایمانی هم که از اول قضیه رو کتمان می کردن،احتمالا زمانی که کاترین در برابر همه منتظر تماس بود، توجه شان به اون سمت بوده. روح آدمی همیشه براش سخته که باور کنه زندگی چیز پوچیه و ما بی هیچ هدفی زندگی می کنیم و در نهایت چیزی نیست. کتاب جالبی بود. هرچند که من از یادداشت برداری جملات نغز کتاب ها بدم میاد، ولی دلم میخواست جملات این داستان افرادی در یک شهر کوچک که تلفن هایی از عزیزان مرده شان دریافت می کنند.و شخصی که به این تماس ها شک دارد و به دنبال اصل قضیه می گردد. Before you read the book, don't forget to ask yourself this: How much do you believe in the story? 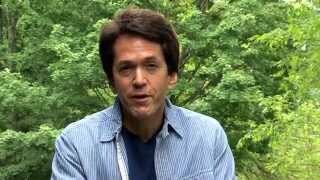 The First Phone Call from Heaven is one of my favorite books written by my favorite author, Mitch Albom. His books are mostly about lessons of life and beliefs in God, and this one is no exception. The story began with some phone calls from the characters' late loved ones in a fictional Coldwater, Michigan. (Even though there's a real Sometimes, love brings you together even as life keeps you apart. The First Phone Call from Heaven is one of my favorite books written by my favorite author, Mitch Albom. His books are mostly about lessons of life and beliefs in God, and this one is no exception. The story began with some phone calls from the characters' late loved ones in a fictional Coldwater, Michigan. (Even though there's a real Coldwater town in Michigan, that wasn't where the story took place.) People tend to regret everything they should've but hadn't done before their beloved friends or family passed away, and most of them shared a common wish---they wish the could talk to the deceased once more. At first, the "chosen ones" received phone calls from heaven, when the shocking news spread all over the town, more and more visitors(worshipers) flooded in. What in life can love not penetrate? Reporters wanted to collect the source firsthand; police officers were dealing with the crowd; vendors and markets were running out of supplies because this small town was facing an unprecedented prosperity; even the certain kind of cellphone, which was the one those chosen ones used, was out of stock in that others believed that was the only brand which could get a heaven call. There is life after this life. I think the reason those deceased people "called" the living was to ensure them that they led a good life in heaven and it was another kind of forgiveness to them. Telling the living that there was no need to worry about them because God would take care of them in the heaven. Of course, how much you believe in this depends on yourself. If it[the world] believes, it behaves better. Indeed, if everyone believes in the heaven call story, it means we still have a thread of hope and that's what keeps us moving on, moving forward. We don't need proof for what we choose to believe. I don't hold a specific religious belief, but in my opinion, it's good to know that even as we die, there's a new life waiting for us--- a bright, hopeful, painless one. After reading this book, you'll know the importance of cherish what you have in presence. Not the past. Not the future. Sometimes hope isn't enough, you still need to seek forgiveness or to forgive others. The ending seems like the same situation in John Green's Looking for Alaska. Instead, I end this as I began it, asking your forgiveness. Perhaps, soon, I will be able to seek the same from my son. Life is unpredictable and we are blessed to live another day in this beautiful world. I felt so much peaceful and blissful after finished the book and highly recommend to anyone who'd like to search the meaning of life. Although it sounds abstract and profound in those ideas, you'll learn a lot in the story. The words and thoughts in the book were far beyond the story itself. Heaven is always and forever around us, and no soul remembered is ever really gone. توقعم از میچ آلبوم، کتابی قوی تر از این بود. Three stars in general, but two stars in comparison to “The Five People you Meet in Heaven” and “Tuesdays with Morrie”.. Finished 7/30: I'm not even sure what I think of this...review and rating to come if I can gather my thoughts. I'm still confused how I feel about this book, but I really enjoyed my time reading it. All the characters were excellent, and Mitch Albom's writing is always intriguing. (view spoiler)[It would be five stars but I'm docking a star for the plot twist. Not because it wasn't good, but because I didn't like it personally. The story didn't turn out how I expected. Which, again is Finished 7/30: I'm not even sure what I think of this...review and rating to come if I can gather my thoughts. On the day the world received its first phone call from heaven, Tess Rafferty was unwrapping a box of tea. I was very lucky to get this book to review it before it is released. I'm a fan of Mitch Albom's books anyways, & this one did not disappoint. People are getting phone calls from heaven - some from family members that have passed away. Children, sisters. Even an employee is getting a phone call from someone he had to fire. Are the phone calls real? The world wants to know On the day the world received its first phone call from heaven, Tess Rafferty was unwrapping a box of tea. People are getting phone calls from heaven - some from family members that have passed away. Children, sisters. Even an employee is getting a phone call from someone he had to fire. Are the phone calls real? The world wants to know when wind comes that the phone calls are happening. Is this the proof everyone needs to see that Heaven is real? We follow the people who are receiving the phone calls & also a man, Sully, as he comes back to the town of Coldwater Michigan to try & get his life back in order. I don't want to give anything away... I just know I loved the book. Its sort of a mystery novel, but also just a touching novel. I actually logged quite a few quotes from the book on Goodreads because it was just so well written in areas. I also love the little points that are made about the telephone & Alexander Graham Bell & his wife. It was put in so subtly but made the book have an extra touch of something special. When I first heard the concept of this book all I could think about was the song by Justin Moore "If Heaven wasn't so far away", which is about what we would do if we could go visit our loved ones in Heaven. It's a favourite song of mine, and therefore, when this book reminded me of it, I knew that I had to read this book. I have never read any of Mitch Albom's books before, but I found this one very enjoyable. I lost my mother two years ago, and reading this book would bring me to tears just thin When I first heard the concept of this book all I could think about was the song by Justin Moore "If Heaven wasn't so far away", which is about what we would do if we could go visit our loved ones in Heaven. It's a favourite song of mine, and therefore, when this book reminded me of it, I knew that I had to read this book. I lost my mother two years ago, and reading this book would bring me to tears just thinking about the "what ifs". Overall, I think this book was very well written, and captured the emotions perfectly. For someone who isn't "into" these types of books at all, it actually has me wanting to pick up some of his other books just to see if they equally as good. I think this would be an excellent book for anyone who has lost someone, as it gives this wonderful sense of hope and peace. نگاه متفاوتی که نویسنده به ماجراهای بعد از مرگ و ادامه زندگی به گونه ایی خاص داره، برام جالب توجه بود. این کتاب میچ آلبوم هم با این که قراره از بهشت چیزی بگه در واقع به بازتاب زندگی ایی که آدما درهمین دنیای خودشون دارند تاکید کرده. از نوشته های این نویسنده خوشم میاد چون معمولا بافت روان و یکدستی دارند و ماجراهای به ظاهر خاص، بدون پیچیدگی و اضافه گویی پیش میرند. How would you feel if you could speak to a deceased love one? Not through a clairvoyant or a Ouija Board; but simply on a telephone. How would it affect your life and that of your community? This is precisely the topic in five-time best-selling author Mitch Albom’s, “The First Phone Call from Heaven”. Readers familiar with Albom’s works will recognize his short story-esque writing which aims to blend inspiration, theology, and philosophy in between the text of a fictional plotline. With that bein How would you feel if you could speak to a deceased love one? Not through a clairvoyant or a Ouija Board; but simply on a telephone. How would it affect your life and that of your community? This is precisely the topic in five-time best-selling author Mitch Albom’s, “The First Phone Call from Heaven”. Readers familiar with Albom’s works will recognize his short story-esque writing which aims to blend inspiration, theology, and philosophy in between the text of a fictional plotline. With that being said, “The First Phone Call from Heaven” is much thinner than Albom’s usual work. 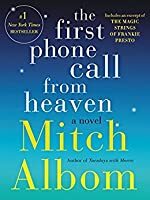 Although it contains a creative story of a small town whose eight “special” citizens begin to (supposedly) receive phone calls from deceased relatives in heaven; the novel is simply not as ‘moving’ as Albom’s books usually deliver. Basically, “The First Phone Call from Heaven” feels too simplified. There is also an issue with the main characters (Sully, Jack, Katherine, Amy, etc) who are much too stereotypical in regards to the story. Of course there is the “one who believes”, “the one who doesn’t”, “the one who doesn’t want to but does”, etc. The characters and their actions are much too predictable. As usual, Albom jumps between the character perspectives which is common to his style but he does so too much in “The First Phone Call from Heaven”. Despite the complaints, Albom does provoke some thought-provoking scenarios which can apply to various facets of life aside from just spirituality. This adds depth to the story and promotes page-turning. However, as one would expect from title, Albom doesn’t shy away from Christian topics (some of his other works are more subtle); so “The First Phone Call from Heaven” is not recommended for Atheists or Agnostics. Although a minor detail, other reviews have noted that Albom always describes the female characters in “The First Phone Call from Heaven” based on looks/appearance but not the male characters (and he seems to have a thing for females with pixie haircuts). I am not sure of the meaning of this but it is noticeable and also annoying. The concluding chapters of “The First Phone Call from Heaven” turn the novel into less inspiration and more of a pseudo-suspense story. This loses potency and isn’t as captivating; weakening the message of faith. This can also be said about the ending of the novel which was not as moving as one would expect from Albom plus somewhat abrupt and not fully executed. Overall, “The First Phone Call from Heaven” is not one of Albom’s strongest novels and lacks his usual depth and inspirational ‘oomph’. I feel all the positive reviews are merely because the masses just think Albom is golden in whatever he writes but in reality, the novel would be rated lower if it was written by another author. “The First Phone Call from Heaven” is a very quick read (1-2 days max), so it is suggested for that; but otherwise it is lackluster. A 4.5. 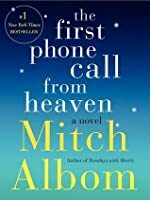 I was a lucky goodreads first reads winner of "The First Phone Call From Heaven" I have always liked Mitch Albom's books. He has a talent for writing books that are heart felt and touching. The First Phone Call From Heaven takes place in Coldwater Michigan. Sully has just got out of jail and is grieving over his wife who died in a car crash. He is trying to pick up the pieces and raise his young son. Soon news hits the small town that some of the towns people are receiving phone calls fr A 4.5. 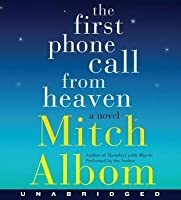 I was a lucky goodreads first reads winner of "The First Phone Call From Heaven" I have always liked Mitch Albom's books. He has a talent for writing books that are heart felt and touching. The First Phone Call From Heaven takes place in Coldwater Michigan. Sully has just got out of jail and is grieving over his wife who died in a car crash. He is trying to pick up the pieces and raise his young son. Soon news hits the small town that some of the towns people are receiving phone calls from relatives. The news worthy part is all of the relatives have died. They are saying that they are calling for Heaven. each person is being told how wonderful Heaven is and how happy and at peace they are.